Milejewel is a Professional Store selling fine jewelry. 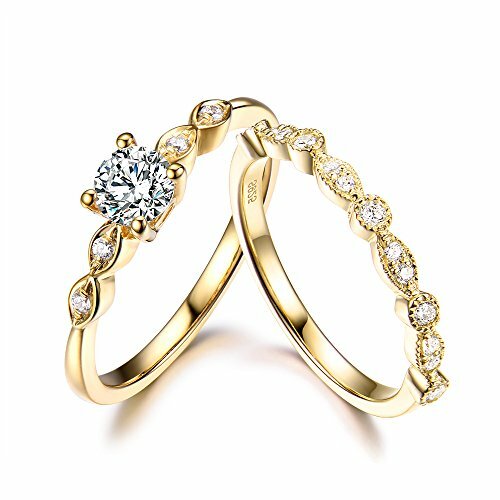 All products enjoy an exquisite craftwork as well as stylish design, AAAAA+ High Quality Cubic Zirconia Stones and 14k gold plated, . 3. Gift: It is a good gift for your lover, families, friends and coworkers. Makes you eye catching in any occasions. Please feel Free to contact with me anytime if you have any question about the products. Thank you. Made with Solid 925 Sterling Silver and AAAAA+ High Quality Cubic Zirconia - Sterling Silver is 92.5% silver, mixed with alloys to increase the strength and durability. SAFE FOR ALL SKIN TYPES - All Milejewel Sterling Rings are hypoallergenic and nickel free so they are safe for all skin types. If you have sensitive skin, you will love our product. This Ring will glorify anything your wearing that day, will get lots of people to compliment you. SATISFACTION GUARANTEED - 30 days satisfaction guarantee and friendly customer service, No questions will be asked if you are not completely satisfied with the product and want to return it. We promise superior service which includes fast shipping, great communication, and Amazon's refund policy. Ship From United State - All of our products are ship from United States to ensure quality, reliability, and punctuality. If you have any questions about this product by Milejewel CZ engagement rings, contact us by completing and submitting the form below. If you are looking for a specif part number, please include it with your message.